Off Topic / Re: Can you help with ideas for fixing a broken display cabinet? You could replace the glass with a bit of clear vinyl. It wouldn't shine the same as the rest, but it would still be functional. And you could maybe paint on it for nifty designs and stuff. Or you could stick the vinyl to the glass pieces (somehow...) so the gap was filled and the break had some support. 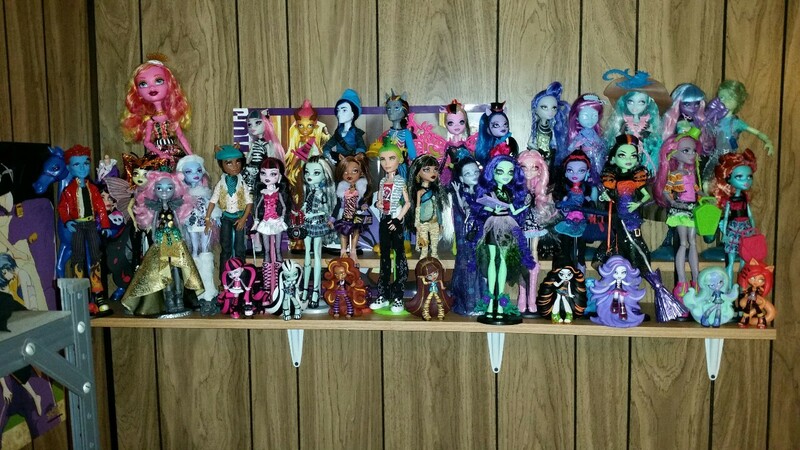 Which size e-tings do people use for Monster High? Is it the same that they recommend for Barbie? Holy crow. I guess I'm stopping in tomorrow. Trader Support / Re: Help justkitter sell some stuff! Usually weights are posted on Amazon listings for things, so that can give you something to go by if you don't have a scale/have something that is too heavy for your scale/too light for the weigh-yourself-holding-the-thing-and-subtract method (or if that doesn't work for you for other reasons). Take things slow with eBay if it feels like a lot. Take 3 or 4 things that you think will sell the fastest, take some good photos, look at some other listings for disclaimers and things other people mention about their items. The convenience of Priority Flat-rate boxes cannot be oversold tbh. Though you end up spending more than metered unless you're shipping something especially heavy. There are also free not-flat-rate Priority boxes, including a size that will comfortably house a couple dolls (it's a bit bigger than the smallest Flat Rate box). My dad ships a lot of cards and likes to cut them up to reinforce his envelopes. There's another category of mailing called Media Mail, which is only meant for books and tape media and things of that sort. The USPS site will have the whole list somewhere. Don't let people talk you into shipping at that rate for items not on that list because it is subject to inspection and it'll get returned and you're out of that money. Thirdly, insurance protects you, not the buyer. If you're shipping something expensive/rare, insurance is a necessity. Others have said that Priority mailings include insurance up to $50, but after that you have to buy it if you want it. It's very cheap, only a few dollars for each $100, but if something goes missing and the buyer wants a refund, it's the insurance that makes sure you're not the one that gets screwed. Note, eBay does not require sellers to refund for lost packages, or to refund for anything at all if everything was as described in the listing. This is something you should build into your price, since eBay doesn't really make it easy to add in their shipping calculator. Me again! (I am like half this thread lmao) and there's so much new clearance! Just left my local Meijer to find the carry case with Space Frankie in it on clearance for $4.49! If anyone wants to trade a couple minis for one of these, hit me up sooner than later. They had a bunch, but this is a really good price. Full disclosure, I'm only interested in keeping a couple of the cases so if anyone just wants the mini, I will only separate a couple of them. Even more secure would be bending it in half around the pin and then making your hooks so they fit into the grooves where the thigh pieces meet the torso piece. But this is a really great idea. I have no idea of the acid content of these boxes, so I wouldn't recommend it for permanent storage, but for moving or keeping everyone organized while displays are cleaned/updated, it'll do the job and keep them from marring each other. I kept the boxes to the vinyls with the boxes to my Figuarts and other figures in a filing cabinet that wasn't being used for files anymore. The only boxes I keep are the ones that can neatly be unpacked and repacked like these. If it's basically made to be destroyed like modern MH/EAH boxes, they get tossed. Rhana - Do you have any trouble with dolls being too tall for that shelf? Like say Casta or Vandala on their stands? I'm not sure who the tallest normal-size ghoul is right now. The wife and I have reservations for fondue, and I have a couple little things for her. She says she wants to bake me something. It's our second Valentine's Day since we got married, so we're all gross and stuff. writtenhuman - Good luck with the LDR! We were like that for a while before we finally were able to move in together. It's the little things that count! Went today, spotted a WTW Kitty, and sig Melody and Farrah all for 9.99. Also a handful of Vinyl Chase Ghoulias. If you need her, hmu. Monster Discussion / Re: How do you justify your collection? I set price points for myself that I try not to buy dolls that are more than that amount, if I can help it. Sometimes I'll stretch that if it appears to be something that's HTF in other areas. I also have set a basic ground rule for sigs only in my collection, unless the exception is pretty special, like Draculauras in yellow or I Fashion ghouls. I found the Color Me Creepy Werewolf starter pack today on clearance for $10 and change, and the 2016 Careers Game Dev Barbie. So I'm a super happy camper. Also they had the Minis in the little packets, not the lockers. I stood there like a loser for like 15 minutes wiggling them into the little windows to try to get the best ones I could lmao. Edit: Oh yeah they had a bunch of last year's Fashionistas too, but I decided to come back for them another day. I've only been to two Walmarts so far, and both are pretty heavily picked-over. But I found a $5 singing Ari today, so that's a bonus. Idk how much she was, but there was a horribly mushed up GSR Lala. The doll looked fine but the box definitely got crushed under something. I guess I'm warming up to gimmicky Sigs. Once I have more doll space (no time soon) I'm curious to see how she interacts with Astranova. The budget and First Day of School versions just didn't have great details to me. As always, check the description to get an idea of what you're getting, especially if box condition is a concern for you on some of these older dolls. Happy hunting! Huh, that site is calling that Clawd Clawdeen. Which doesn't suit her aesthetic at all. So by some miracle, I found a handful of Halloween minis at my local Walmart today! I bought six, and ended up with three extras, two Draculauras and one Frankie. Ironically, the Cleo had been clawed open by someone was the only one I didn't end up with a duplicate of. I haven't bought many of these right now, so I don't have any of the regular ones to offer. I'm interested in anything I don't already have. Which is shorter than my want list, so I'll just leave a list of what I have here lol. I am especially looking for the Beach Cleo exclusive from the three pack. If you're interested, go ahead and PM me, but I'm hoping for a bit better than a 1:1 trade on these, since they're so hard to come by, unless for other Halloween minis. Edit:1 Halloween Drac and Halloween Frankie are gone! Still one Halloween Draculaura left! My 'have' list has changed a bit, too. Off Topic / Re: Randoms to ID please ! The two rose pink purses (the sparkly longer one and the clutch) are Barbie items, and I'm pretty sure the helmet is too, but may be for one of the younger sisters depending on its size.